Share ten random things about you. A friend I recently met sent several of us this request in a group email - I assume for all of us to get to know each other a bit better. I thought it was a neat idea and I thought I would have no trouble coming up with random things about myself, but oddly enough, it was actually quite tough. Random and stupid walk a very close line - and there is a lot more stupid than random in my headspace. I remembered I'd written about something similar to this before, but those were more of the shameful, dirty little secrets I harbour. You know, the embarrassing stuff that no one should know about? Stuff you probably shouldn't post on one's blog if one doesn't want anyone to know? Even my most shameful truths (and even those those are hardly shameful) had nothing on one of the girls in the group. I'm not sure if she misunderstood the ask, but she sent through some shocking admissions. Naturally, I did what any new friend would do - I started busting her lady balls about it. She's a good sport. Let's see. Ten random things? Well, for starters, I have lip balm and hand sanitizer readily available at all times on every floor of my home, car and handbag. That's pretty random, yes? I guess you could say I'm a germophobe that likes soft lips. I am terrified of inflated latex balloons. This stems back to my childhood when my cousins would pop them in my face to get a reaction. Jerks. Later in life, I used to tell people I was allergic to latex. Let me just say it's gotten me out of several birthday parties I didn't want to attend as well as a few sticky situations. Shellfish is my kryptonite. I'm actually anaphylactic. Homemade macaroni and cheese is my all time favourite food; Mexican food is my other, although I am currently on a quest to consume the world's best doughnut. I could eat said foods all day, every day. I absolutely hate the smell of burnt toast. It makes me gag. I love board games. LOVE. I don't care if you're my neighbour or the President of the World, if you come to my house and I pull out the board games, you better play. I do not like meat on my pizza. People assume because I blog about sugar-laden desserts that I don't eat healthy, when in fact I actually do. Some of my favourite dishes are vegetarian and some are even vegan. I love food and I don't discriminate. My problem is I don't know when to stop. I used to play the violin, but gave it up because I found it really boring. I really wish I kept going with it and can kick myself hard when I think about it. There you go. Ten random things. 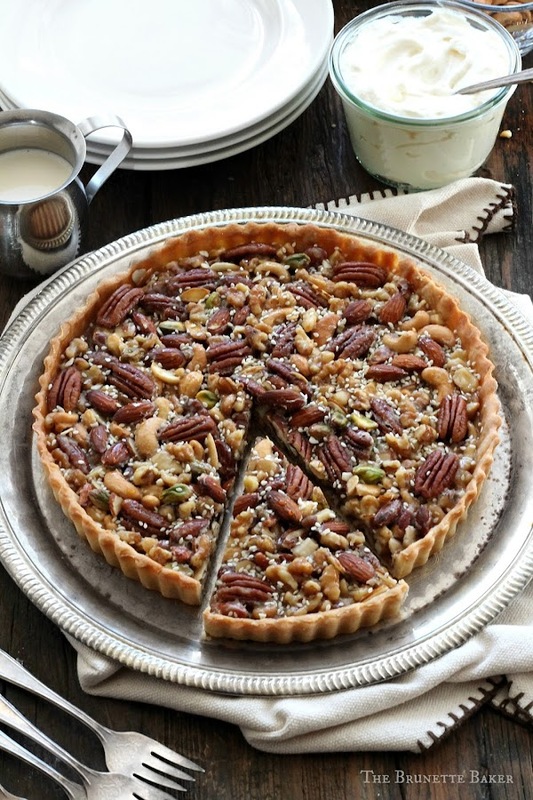 Here's a total random thought - this Caramel Nut Tart is a great example of dessert perfection for me. Throw in a cup of tea and I'll be your best friend. I omitted any chocolate on this treat as I felt it was rich enough, but if you're feeling extra-indulgent, a drizzle of melted chocolate would be incredible. You know what else would be even more incredible? A dollop of maple bourbon whipped cream. In a large mixing bowl, whisk together flour, powdered sugar, and salt. Add in cold, cubed butter. Work butter into flour with two forks or a pastry blender until coarse crumbs begin to form. Add in ice water, one tablespoon at a time, until dough comes together. Form into a ball and cover with plastic wrap. Refrigerate for 30 minutes to allow proteins in flour to relax. Roll out dough on a lightly floured surface to 1/4 inch thickness and 12 inches in circumference. Carefully transfer dough to a 9-inch tart pan with removable bottom. Press dough into bottom and sides to fit and remove any excess dough. Prick the bottom with a fork and place prepared tart pan in the refrigerator for 30 minutes. Preheat oven to 350 degrees F. Line prepared tart pan with aluminum foil and fill with baking beads or dried beans. Bake for 15 minutes. Remove foil and beans or beads and bake for another 10 minutes. Remove form oven and allow to cool. While crust is cooling, make caramel sauce. In a large saucepan over medium-low heat, combine and stir water, granulated sugar, and brown sugar together. Stir only until sugar has dissolved. Once dissolved, add in corn syrup and increase heat to medium. Bring mixture to a boil for five minutes. You can swirl pan and remove any crystallization on the sides with a wet pastry brush should any form, but do not stir. Once sugar begins to thicken and deepens to a golden amber colour, remove from heat. Add heavy cream (taking care as it may bubble up) and butter. Stir until melted and creamy. Add in nuts. Stir to coat. Evenly pour nut mixture into prepared tart pan. Sprinkle sesame seeds over top. Bake for 15-20 minutes. Caramel will be bubbling. Remove pan from oven and allow to cool completely on a wire rack before cutting. Serve with a dollop of whipped cream or a drizzle of chocolate for an extra-indulgent treat. I've always wanted to know someone who fears balloons. Way cooler than the more common fears of clowns, bears and heights. I can't decide what I enjoy most your photos or your recipes. They r both wonderful. Thank u for sharing. 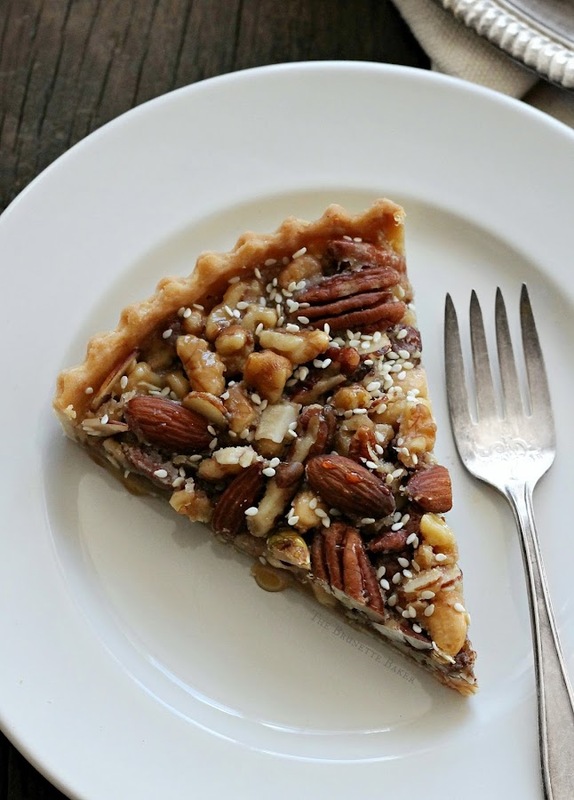 This tart is absolutely gorgeous and I'll bet it's delicious too! Bookmarked for my holiday baking! Thank you!! 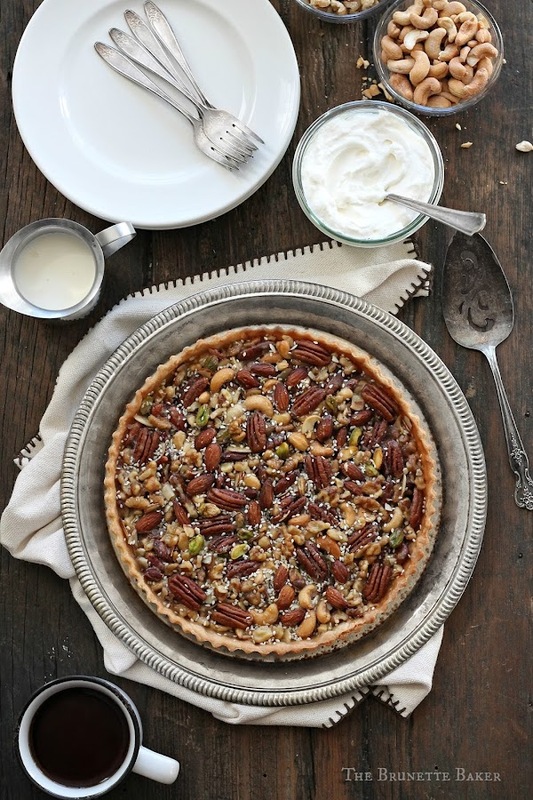 Love the 10 things (I also love the office, I hate shellfish-not allergic, just hate, and I don't like meat on pizza either :D) and this tart looks gorgeouuus and delicious!